If you own a horse, then the chances are that at some point you might want to transport them somewhere. This is done using a horsebox or horse trailer, to ensure that the horse is safe during the journey. Loading your animal into the trailer can prove testing, especially if you have not done it before, so thinking about safety is important. Having the appropriate insurance cover in place offers you the peace of mind that you may need. 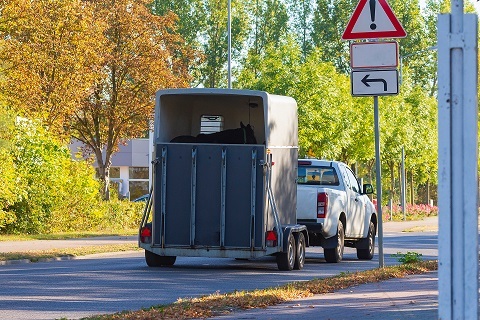 Be aware that when driving with the trailer, your horse is coming along for the ride as well. You don’t want the journey to be too bumpy for obvious reasons and care should be taken when driving around corners. Slow and steady with no hasty decisions is advisable. Confidence is also key and practicing a drive with a horse trailer attached could assist when you come to make the actual journey with the animal. Horse trailer insurance is relevant for a selection of people. These include horse owners attending weekend events, those buying or selling horses, stable owners and horse trainers, owners who want to ride their horse in a new place, plus horse owners who want to take their horse abroad within Europe for holidays or events. Horse trailer insurance, although a niche product, has a large market due to the nature of the horse industry. There are so many events both in the UK and Europe, with many horse-riding schools and competitions continually opening. Horse riding is popular with different age groups, and so the market for the transportation trailers goes further than many people may assume. At Insurance Protector, we can discuss your options and look at the policies that will cover your horse trailer for risks. Give a member of our team a call today, or leave a message and someone will get back to you.